Since embarking on this journey to lose weight, become physically fit and lead a healthy lifestyle I have received so much inspiration, support and motivation from blogs. I love the excitement and enthusiasm in the posts of bloggers who reach their goal weight, PR a race, lift a bigger weight or fit into a new size of jeans. I also appreciate the raw honesty of bloggers who share the challenges and obstacles they face along the way. The reader comments are typically full of encouragement, cheers and helpful advice. For me the blog has been a great space to share my love of running and how it is helping me to come to terms with my lifelong struggle with weight, poor body image and lack of confidence. Part of this process for me is learning to be proud of my accomplishments and ultimately to really love this new person I am becoming. We are so quick to put ourselves down. I am great at doing that, but I have difficulty accepting a compliment or singing my own praises. When I wrote the post Bragging Rights it was also a call to anyone who wanted to share something awesome that they have accomplished. Deb has recently celebrated a couple of big accomplishments. She graciously agreed to write a guest post. I’m so honored to share Deb’s inspiring story here. My name is Deb, and I am a runner. A little over a year ago, I would have never believed it. I was a depressed, 100 pound overweight semi-couch potato. I say “semi” because, like Aimee, I am an RN who works night shift. Any nurse will tell you, we get plenty of “exercise” running up and down the hallway for eight to sixteen hours at a time. But, all that “exercise” I had over the last 27 years didn’t prevent me from becoming morbidly obese. I think we can all agree that it’s challenging enough to exercise and lose weight. But, when you work nightshift, it’s like climbing Mount Everest. Well, maybe not quite THAT hard. But, I’m sure you can appreciate the obstacles. When you’re chronically sleep deprived, unhealthy carbs are the stimulant of choice, and there is usually no shortage of them – chocolate kisses at the front desk, donuts in the staff lounge, and a multitude of sweet or salty options in the vending machines. And, that’s just on a regular night. During the holidays, it’s a veritable smorgasbord of cookies, cakes and brownies! As for healthy eating habits, sitting down for a meal is not always possible, especially on a busy labor & delivery unit. Donuts are great for eating on the run! As for “real” exercise, when faced with the choice between a treadmill and a nap on the couch, the nap is pretty hard to resist. But, “choice” is the operative word here, isn’t it? Last year, I realized it was past time to start making better choices. No more yo-yo dieting. No more binge eating. No more mindless snacking. No more excuses for not exercising. I knew that if I continued on the same path I was on, I would dread my 50th birthday; I would never know the joy of slipping into a size 10 and loving what I see in the mirror; I would never let my husband see me naked again; I would never know the simple pleasure of walking uphill without getting out of breath; I may die of some chronic illness and never get to enjoy my future grandchildren. When I looked at it that way, the choice became quite clear. I’ve lost weight before, too many times to mention. I’ve always fallen off the diet bandwagon and ran out of steam before ever reaching my weight loss and fitness goals. But, THIS time, I decided to go public. I confessed to my family, and all of my friends and coworkers, that I was embarrassed that I let myself become so overweight and out of shape; that I avoided having my picture taken, and didn’t attend family gatherings and other social outings because I was ashamed of my appearance; that I didn’t want to hide anymore because I missed them. I asked them to keep me accountable and I promised them that with their help, I would commit to taking better care of myself. I received such an outpouring of love and support, that I cannot begin to express my gratitude. It made me finally realize I AM worthy. More than anything, I’ve wanted to make my kids proud of me. They’ve seen my weight go up and down over the years, and they’ve learned to accept my many attempts to “take better care of myself” with a big grain of salt. One afternoon, my son and I were taking a walk in our hilly central PA neighborhood – me huffing and puffing and making the usual promise to get in better shape — when my son told me about the Couch-2-5K running program. I said, “I’m doing it!” Whether he believed me or not, I was determined that THIS time, I wasn’t going to let him down. In order to keep myself motivated, I registered for my first running event, The Great Race 5K, in Pittsburgh, PA in September 2012. It was a life-changing experience. There was so much energy and emotion! I stood toward the back of the pack – it’s was a HUGE crowd — and looked around in amazement at all the shapes and sizes of runners. Music was playing and people were stretching and warming up. I couldn’t believe I was there and I was actually going to run a 5K. My only goal was to finish the race. After the National Anthem and the sound of the gun, we began to move toward the starting line. I was so overwhelmed with emotion; I could feel my eyes welling up with tears. But then, as I fell into pace with the rest of the runners, I felt my confidence soar. Around mile two, the course begins a slow steady uphill climb. A nice gentleman talked me through it and when I reached the crest, it was downhill the rest of the way, and I knew I was going to make it. For the last half mile, I couldn’t help laughing with the sheer joy of it. I saw my son and husband in the crowd, cheering me on, and I couldn’t stop smiling. I never felt more proud of myself when I crossed that finish line. From that day on, I was completely hooked on running, and I couldn’t wait to do it again! Despite all that great exercise, I noticed I wasn’t losing any weight. My husband felt inspired by my 5K, and we decided to help each other reach our weight loss and fitness goals. We joined Weight Watchers together and we starting going to the gym on a regular basis. And, of course, I began training for a half-marathon! 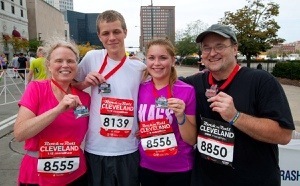 I ran my first half marathon at the Rock & Roll Cleveland with a time of 2:43, and I’m hoping to PR at my next half marathon on November 2nd. I decided to borrow Aimee’s idea and try to run a race every month. I find I really like the discipline that being in training mode requires. It keeps me motivated. But, more importantly, it’s fun! How do I know THIS time I’m going to keep the weight off? Because I know if I slip up — and I probably will once in a while — I have the tools, and the support to get right back on track. I know how good it feels to make the right choices for my health and well-being. Thank you so much for sharing Deb! Congratulations on the half marathon and achieving Lifetime membership with Weight Watchers. You look fabulous for almost 50!! Do you have anything you want to brag about? 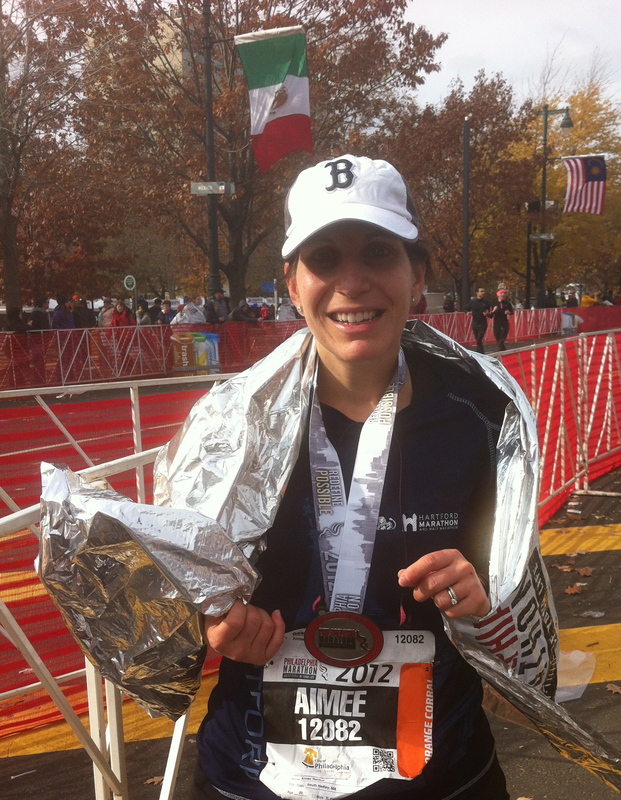 For some reason I can’t see the picture, but awesome guest post to share with us Aimee – thanks Deb and congrats on your hard work and dedication. My favorite part of this whole post? Biz thank you for letting me know about the photo. I think it’s fixed, but let me know if it’s still not working. Thank you, Biz and Marion! And thank you, Aimee for letting me share my story!